Our dear compañera Sol was pointed out by power and accused of the attack on the miserable Banco Estado security guard Rolando Vargas Fuentes, in which 4 bullets were fired as a gesture of revenge for the murderous shots that another of his colleagues fired months earlier at the body of the anarchist compañero Sebastián Overluij. Sol was arrested on the same January 21, 2014 when she was caught inside of the 58th Precinct with the guard’s loaded weapon. After being restrained, she was arrested and taken the next day in a heavy security detail, which was broken by the unshakeable affection of her family, who remained in spite of the threats of weapons and repressive force. 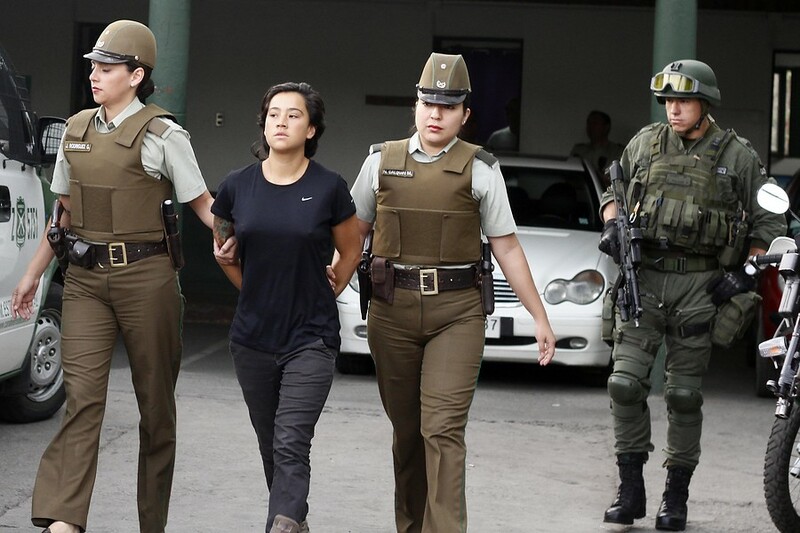 During the morning of January 22nd, the compañera was taken to the (in)justice center, where she faced the accusation brought by the northern central prosecution under the prosecutor Álvaro Nuñez. Early on, the versions of the press and police considered, as almost the only possibility, romantic ties and sentimental issues with the miserable guard. We understand this within the patriarchal hegemony of the society in which an armed woman can only choose and opt for the path of violence when she is “emotionally unstable,” “hurting” and “carried by romantic feelings,” eliminating any potential for autonomy and combative decision. 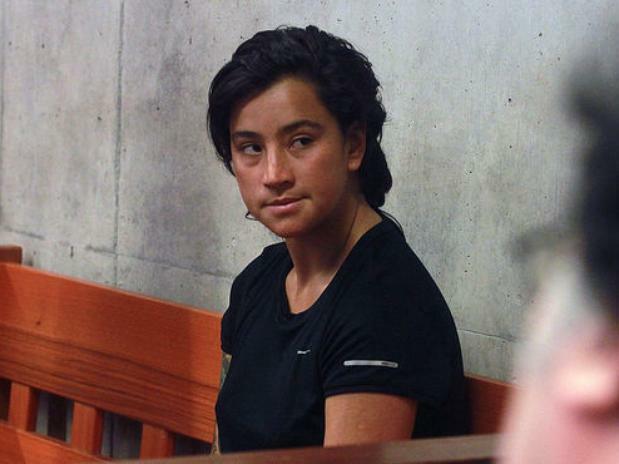 Even worse, since it was obvious that there wasn’t any connection between the arrested compañera and the one who decided to take care of the privileges of the rich, since then the only police/journalist theory that power affirms is the possibility of some romantic tie between Sol and the compañero Angry [Sebastián Overluij]. Desperately reiterating some explanation of a “sentimental/romantic” nature for the idea that a compañera would carry out armed actions, and in the face of the obviously explicit act of revenge for the murder of an anarchist. We reject these kinds of explanations and combat them profoundly; the compañerxs in struggle take their ways of life on the basis of decisions of struggle which, although guided by the heart, also advance by the negations of this world. After setting restrictions on the compañera’s hearing and having the courtroom gone over by dogs in search of explosives, finally Sol’s parents and grandparents were able to enter, leaving family members, friends and compañerxs in solidarity outside. The evidence was the photographs and the security camera from the bank, as well as 5 witnesses who were present at the attack, who all agreed that the attacker shouted “This is for Revenge!” Also in the hearing they mentioned the statements of the officers from the 58th Precinct who arrested Sol when she tried to draw the revolver in the station. On leaving the hearing, there were confrontations between the compañeros in solidarity with journalists and police who left several compañeros beaten and one compañero arrested for aggression against a journalist, who was released after a couple of hours. Strength to Compañera Sol in this and in all that comes: We are with you! This entry was posted on Monday, February 3rd, 2014 at 4:47 pm	and is filed under Direct Action.